Books of Life is an Aboriginal education awareness and literacy initiative of the Ontario Teachers’ Federation (OTF), funded by the Aboriginal Education Office (AEO) of the Government of Ontario. The project seeks to engage teachers in a greater understanding of First Nation, Métis and Inuit (FNMI) communities, so that they can confidently imbed FNMI themes, topics and perspectives in their teaching. During the 2011-12 school year, Books of Life brought together teachers in schools with high FNMI populations and those in schools with low FNMI populations. The teachers worked with their students to create books about their lives – exploring who they are, what they value, what they celebrate, and how all of our lives are shaped by our cultural and historical contexts. 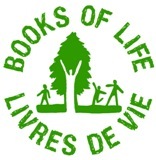 There was a book launch for Books of Life at the 2012 Toronto Word on the Street Festival. Two of the teachers and some of their students read from their work in the Children’s Reading Tent.